Blue water diving is a highly specialized mode of scientific diving that lets researchers observe, experiment, and collect delicate midwater organisms in situ. 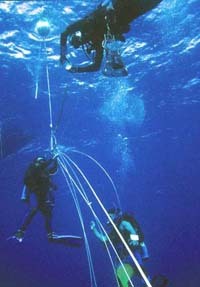 A weighted down line is suspended from the surface for the divers to attach the “trapeze” to which they attach their individual safety lines. Divers are attached to their safety lines by quick releases and a safety diver watches over all of them from near the trapeze throughout the dive.